Comments Ancient Vedic scriptures speak of a demon God Vala, causing troubles to the Demi-Gods, and they in turn developed a plan and captured and killed him! 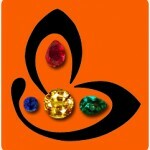 Vala’s body was then cut into pieces, which fell on Earth and germinated into seeds of precious gems! His skin was said to have a golden glow and was supremely lustrous! And this formed the seeds of Yellow Sapphires!From the Ratnapura mines of Sri Lanka, This Rich Butter Yellow colored fully natural and untreated Yellow Sapphire is from our new lot Golden River 2011! With exceptionally powerful energies, a luxurious color and divine lustre, this eye clean gem, which is overflowing with the Sattvik and Jyotish qualities of the benign planet Jupiter! An exceptional talisman! 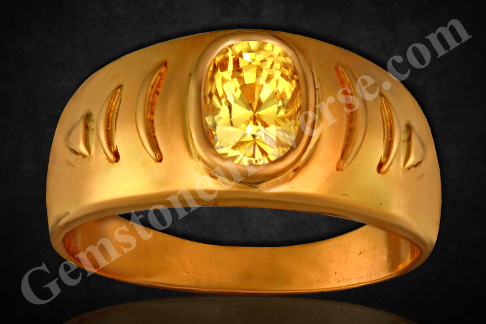 Has made a powerful talisman when set in this solid 22k Gold ring! Note: For more information about our new lot Golden River 2011 click here!